Find out who’s winning the Keyword Battle. Is it you? Or your Competitors? Who’s Winning The Keyword Battle – You, or Your Competitors? In last week’s PPC Tuesday article, Brian introduced you to the Auction Insights tool in AdWords. This week, we’ll take a more in depth look at that tool including how to interpret each metric, as well as some sample data to provide some context. Let’s say you’re running paid search campaigns in AdWords and everything is going great. Clicks are up, cost is down, and return on ad spend is better than ever. You’ve optimized keywords, ad copy, and bidding to create a revenue generating machine. However, while you’ve been hyper-focused on your account’s performance, you may have overlooked one important thing: how are you faring compared to your competitors? In case you missed it last week, the new Auction Insights tool within Google Adwords allows you to see metrics on how various keywords are performing within your campaigns compared to the same keywords being bid on by your competitors. While this tool won’t magically reveal your competitor’s return on ad spend or secret bidding formula, it will help inform keyword bidding strategies in ways that weren’t possible until now. The tool can be found by drilling down to the keyword level of any campaign, selecting a single keyword, then clicking the “Keyword details” and selecting “Auction Insights”. The tool displays your keyword metrics at the top of the page, and all other domains (competitors) below. Keep in mind that the metrics are based on a single keyword. In this case, let’s say it’s “example keyword”. Now, let’s take a deeper dive into the metrics and how they relate to the sample data above for our “example keyword”. Impression Share – Impression Share is the percentage of impressions you received divided by the estimated number of impressions you were eligible to receive. Eligibility is based on your current ads’ targeting settings, approval statuses, bids, and Quality Scores. In this example, our impression share for “example keyword” is 98%. This means that every time the keyword was eligible to trigger an ad, it did so 98% of the time. Naturally, you want your impression share to be as high as possible. If your impression share is low compared to your competitors, you may need to increase your bid, create more relevant ad copy, or even change the landing page of your ad to ensure a higher quality score. 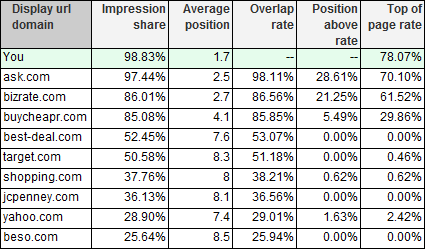 Average Position – The average position shows where your ads appeared on average when they received an impression. This is the same metric that you’re used to seeing when viewing campaign, ad group, or keyword metrics. As always, the higher your average position, the better. In the example table, our average position is 1.7 for “example keyword”, which is much higher than our competitors. Overlap rate allows you to see which websites you’re competing with most often when your ads are impressed on the same search results page. The higher this number is for a particular competitor, the more often both of your ads are shown together. In the example table, you can see that we’re competing most often with Ask.com, Bizrate.com, and BuyCheapr.com for “example keyword”. Position Above Rate – When you and another participant received an impression in the same auctions, “position above rate” shows often the other participant’s ad was shown in a higher position on the page than yours was. When looking at the “position above rate” for your competitors, the lower the number is the better. A low number here means that your ad is showing above your competitor’s a majority of the time. According to the table, Ask.com has a “position above rate” of 28.61% for the “example keyword”. This means that our ad is showing above theirs 71.39% of the time. Top of Page Rate – When a participant’s ad received impressions, “top of page rate” measures how often it appeared at the top of the page above the organic search results. You generally want the “top of page rate” number to be as high as possible if your goal is to be in the top 3 paid search results. This is the area that lets you take advantage of things like enhanced site links. As you can see, our “top of page rate” for “example keyword is 78.07%. Very respectable! The Auction Insights tool can be a good resource to start to understand how your bidding strategy stacks up against your competitors’. It can help you find areas in need of optimization, as well as competitive gaps that you may have the opportunity to fill. Keep in mind, these numbers aren’t 100% dead accurate, but they can certainly start to give you an idea of your competitive keyword landscape. So if you feel you’ve exhausted all of the areas for optimization within your account, try putting on your competitive goggles and take a look at the Auction Insights tool.